Make a Grand Statement, for well under a grand! ON SALE NOW: Many different styles of conference tables in different finishes, shapes and sizes! 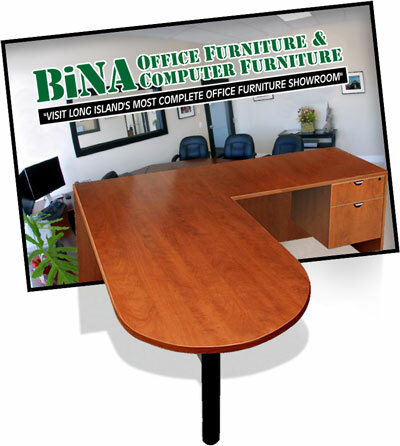 Hurry in to BiNA Office Furniture NOW! 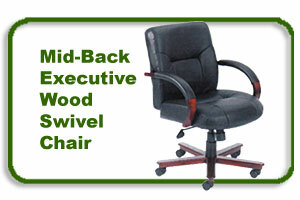 One of life's perplexing challenges should not be what kind of chair you should buy. Ultimately it's your seating style and preference that matter most. But just in case you're trying to make an office suite of more than one, we carry a lot of chairs for just about every office style and temperament. 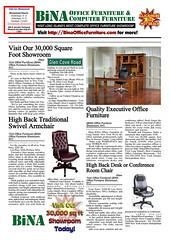 Browse some of our current hot specials and real red hot deals, then come in to our showroom to "seat" for yourself! Confer no further - we have a 30,000 square foot shopping center of seating specials. Try before you buy, visit our showroom of chairs: leather, mesh, health-care vinyl, fabric, wood, more..
Browse our mini-sampler of seating online and come in for the real deal! Featuring stylish curved panel legs and dark inlay on cherry wood finish, this conference table will be the topic of conversation at every meeting! Shown here as 96" (8 feet) long by 42" wide, seats eight in style and comfort. 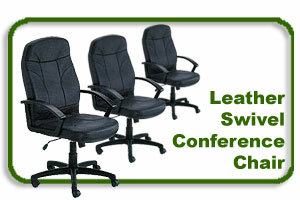 We also carry an extensive selection of conference room chairs and other matching items in our 30,000 sq ft Call to Order Online. Other sizes available. Visit our showroom for complete details and see it for yourself. Solid and stable, this office chair also offers a distinct modern flair. Perhaps Napolean would never have met his Waterloo had he sat down and talked things out around one of our oval racetrack conference tables. Plan for the next successful campaign of your own design, by visiting our New York office furniture showroom and selecting the table for your conference room and appropriate conference room chairs for your client meetings and budget. Let us know your conference room dimensions and number of persons you wish to seat, we can help you choose from our selection of conference tables, and get you back to business without delay. Our professional fleet delivery is always ready to take charge of project to get you setup and ready for clients and staff meetings with pizazz! Choose from high back leather chairs to simple fabrics, we have a showroom full of chairs for you to SIT in and TRY out in person, not just guess via some webpage picture. Plus we never charge you for chair assembly, so get your quality chairs setup for free regardless of which model you buy. 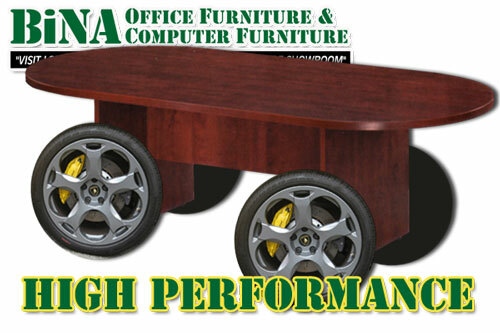 Suit the needs of your conference room table, whether traditional rectangular wood table, or an oval racetrack or boat-shaped conference table, our showroom has a fine selection for you to choose from in various colors and finishes.